This is superb palace-and-park ensemble of the late XVIII - begining of the XIX centuries which was used as a summer residence of the Russian emperor Paul 1 and his family. The landscape park, one of the largest in Europe, covers the area of 600 ha. 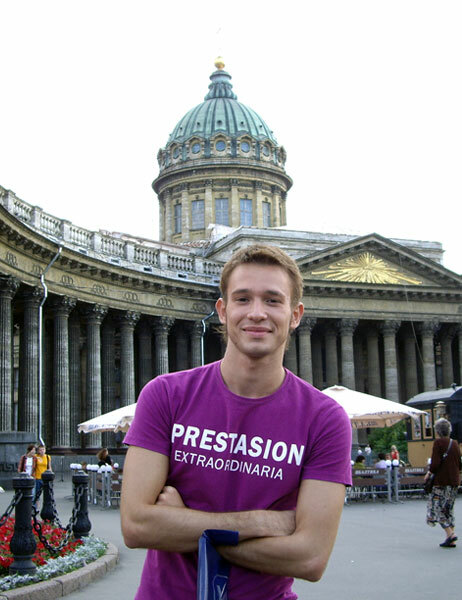 The works on the palace-and-park ensemble on the winding banks of the Slavyanka river lasted for 50 years. Architects: Ch. Cameron, V. Brenna, G. Guarenghi, A. Voronikhin, C. Rossi, sculptors M. Kozlovsky, I. Martos, I. Prokofiev, F. Gordeyev, G. Demut-Malinovsky. 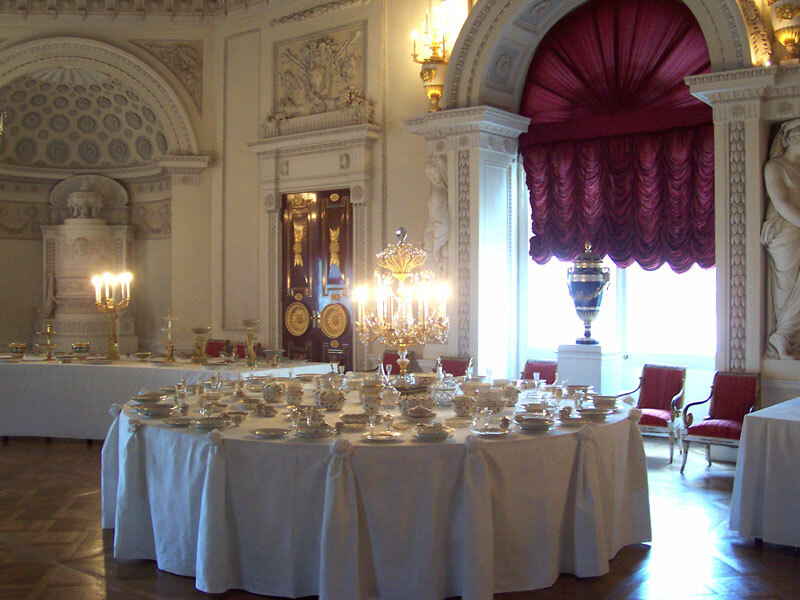 The formation of the collections of the Pavlovsky Palace was closely connected with the trip of its owners over Europe in 1781-1782. They visited workshops of well-known artists, ordering and acquiring paintings, furniture, bronzea articles, silk fabrics, china sets etc. They brought to Russia a large number of antique sculptures from Italy, as well as gifts from Europesn royal courts. Walking through the halls and along the avenues of the Pavlovsk palace and park complex, one cannot help feeling an admiration for the versatile talent and inexhaustible imagination that are embodied in the surrounding landscape and architecture. 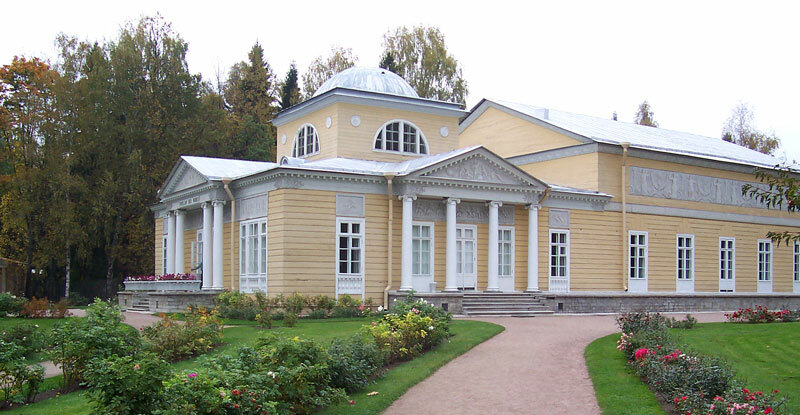 Nature and the daring creative effort of man, the solemn grandeur and the heartfelt simplicity - all this is Pavlovsk. "Pavlovskoye, begun 1777", reads an inscription on an obelisk commemorating the foundation of Pavlovsk. This country residence, named after its first owner, Paul I, son of Catherine II, was built in the royal hunting grounds on the banks of the Slavianka, three kilometres from Tsarskoye Selo (now the town of Pushkin). Among those who contributed to the building and decoration of Pavlovsk were such brilliant architects as Charles Cameron, Vincenzo Brenna, Giacomo Quarenghi, Andrei Voronikhin and Carlo Rossi; the celebrated Russian sculptors Ivan Prokofyev, Ivan Martos, Mikhail Kozlovsky, Fiodor Gordeyev and Vasily Demuth-Malinovsky; the talented artists Giovanni Scotti, Andrei Martynov and Johann Mettenleiter, and that unsurpassed master of perspective painting and genius of landscape gardening Pietro Gonzaga. Forming a single architectural and artistic whole with the park, the Pavlovsk palace employs in its design such relationships of architectural volumes and masses that, despite its rather small dimensions, the palace's building produces the impression of a majestic monumental edifice which, at the same time, is organically set in the surrounding landscape. Erected on a hill, the palace takes in the earliest and the latest rays of the sun. The rising sun is reflected in the mirrors of the halls and the palace seems to be lit from within like a precious stone. The suites of the Pavlovsk palace belong to the best achievements of Russian architecture. The round, oval, octagonal, rectangular and square halls and rooms of the palace are faced with artificial marble or coloured stucco and covered with paintings or moulded ornaments. The strict articulation of the smooth walls is enlivened by a delicate range of the rosy, greenish, golden, white and lilac hues of the interior finish and decor. The play of colour is enhanced by the well-planned illumination of the palace. While the flood of light streams into the Italian Hall through the glazed part of the dome, it penetrates the Grecian Hall through the tall windows, and also flows in through the windows of the adjacent Halls of War and Peace. The Picture and Church Galleries have rows of windows on both sides. Light also contributes to the charming atmosphere of the Little Lantern study. The famous Russian architectural historian Vladimir Kurbatov, author of books on St Petersburg, Pavlovsk and Gatchina, as well as the monumental labour Gardens and Parks of the World, wrote in 1911 in his Pavlovsk guidebook: "No matter how beautiful Pavlovsk Palace is, no matter how precious its collections, it cannot be compared to Pavlovsk Park." 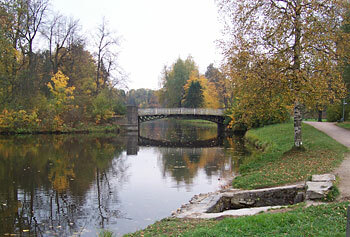 The Pavlovsk Park has indeed long enjoyed the fame as one of the finest landscape parks in Europe. Poetic and endlessly diverse, it corresponds, in the words of the early nineteenth century French writer Saint-Moret, "to all tastes and to all states of the soul". "Each new step brings a new picture to the eyes" was how Russian poet Vasily Zhukovsky described a walk through the Pavlovsk Park. Analyzing the reasons for the attraction of the park, the main contribution is often regarded as being the wonderful proportionality of the natural landscape and the architectural structures, which stand in complete harmony with the world of man in regard to the relationship with the surrounding environment. This is reflected in every aspect of the park's rhythms and dimensions, in the idiosyncrasies of its visual perception and the speed of progress along its pathways, whether it be by foot, horseback or carriage. The park's beauty was guaranteed by the choice of the natural undulating landscape. The other services of the park's founders were their impeccable feeling for nature and ability to utilize its great wealth of possibilities. The idea of using the Slavianka river valley as the compositional axis of the park was also a stroke of genius. The rises and twists of its river banks permit an harmonic comparison and contrast between the clear, austere architectural forms of the constructions and the forest vegetation. The trees in the Pavlovsk Park are not themselves noted for their vivid beauty, as is often the case in gardens in southern climes. Rather, they merge and contrast, like the paints on an artist's palette, coming together to form a harmonic whole. It is therefore sometimes difficult to distinguish the significance of one particular section of the park. 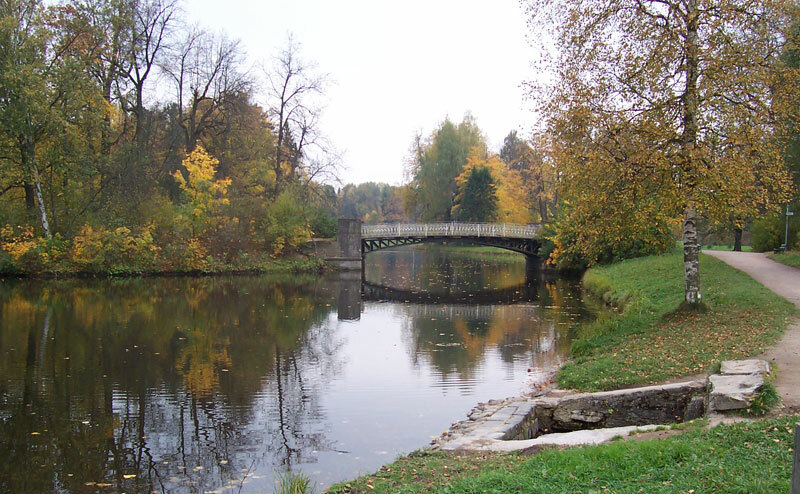 And it is this mutual link between all the constituent details that lies behind the force of impact always felt by visitors to the Pavlovsk Park. Spread out over an area of 1,500 acres, the park is made up of a wide range of very different regions, ranging from the shady forest paths of the Valley of Ponds to the wide open spaces of the White Birch. Strangely enough, the transition from one section to another never evokes the sensation of passing into another park, so naturally is everything linked in one original whole.